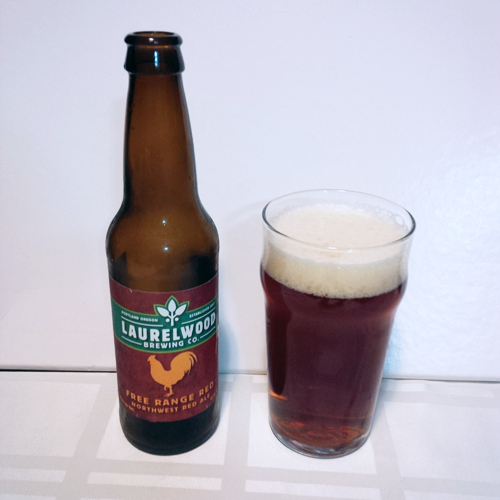 Laurelwood Brewery Free Range Red Ale: Brewed in Portland, Oregon at a strength of 6.1% and 60 IBU’s this was actually the very first beer I had on my first self guided brewery tour a few years back when they had a public house in North West Portland. It is memorable for me as it was one of the first beers that got me into craft beer and I was curious if it still held it’s ground on my ever growing palate. I mean I will always have an appreciate for it and this brewery, however I haven’t had it in few years so on my last visit I picked up a bottle. Aroma and Appearance: It pours a clear reddish brown colour with some sporadic bubbles and one finger of off white foam. The aroma was primarily toffee, raisin and rye like bread. Flavour: Similar to the aroma, the toffee and raisins are present up front. In the middle is earthy barley malts and hints of brown sugar with woodsy citrus “aka North West” bitter finish that I have come to love. Overall Impression: Red’s are very dichotomous for me, I love them or hate them and this one I love. I suspect that I dislike CaraRed specialty malts found in some reds and it was not present in this one according to the brewery website so I may be on to something here. Rating: Still an excellent beer, 8/10 and I don’t think it’s just nostalgia talking. Food Pairing: The first time I had this it was with pulled pork sandwiches and I stand by that pairing suggestion. Ah yes, I remember it fondly too as the first Portland beer that made an impression on me.